The Flying Fists of Power! is a 1985 Masters of the Universe mini-comic written by Tim Kilpin and illustrated by Jim Mitchell and Steve Mitchell. 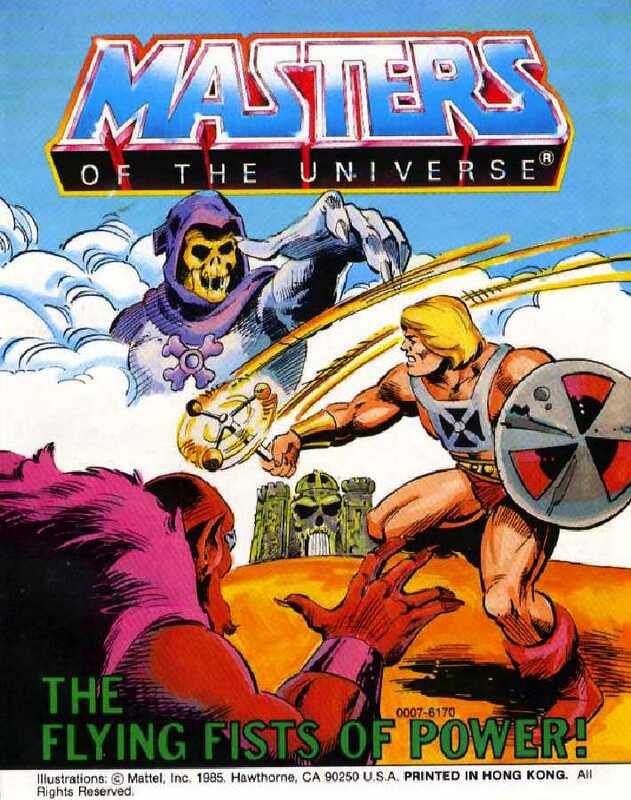 Here, Skeletor abducts Prince Adam and then tries to extort his way into Castle Grayskull. Ah, the other terrible He-Man variant. At least we’re spared the metal undershirt that the toy wears. There’s no purpose otherwise; these flying fists don’t let him do anything he can’t do ordinarily (there isn’t any actual use of fists here), and he doesn’t hurt anything with that fancy mace except Skeletor’s dignity. The writing strains credulity at times. They kidnap Prince Adam – not a new plot by any stretch – but let him keep his sword where he can reach it. The henchmen disappear at the same time, letting him escape. And now he doesn’t even have to hold the sword in his hand to become He-Man? Is that what we’re doing now? How convenient – except that he should be able to reach it anyway. There’s also a weird vibe going on between He-Man and the Sorceress at the beginning, almost like she’s playing some kind of deity role. The art is fair, overall. The artists do a good job with poses (well, usually – but not on page 11) and faces, but that’s about all there is, as this comic suffers from a severe lack of backgrounds, which keeps it from establishing any meaningful kind of atmosphere or setting. It’s not great, but it’s somewhat more enjoyable than the sum of its parts would suggest.